There are few foods as delicious, versatile, satisfying, and popular as sausage. 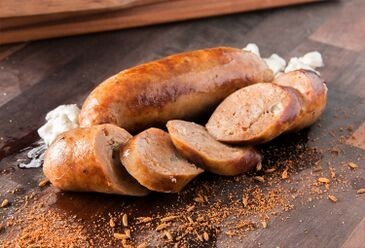 The perfect meat any time of day, sausage can easily be the star of breakfast, lunch, and dinner! But if you’re watching your fat intake, or simply want to mix things up, our preservative-free chicken sausages make a tempting addition to the menu. That way you can have your sausage, and keep your fat in check, too! Rastelli Market takes flavorful chicken sausage to a whole new level with oh-so-perfect recipes to tempt anyone’s taste buds. 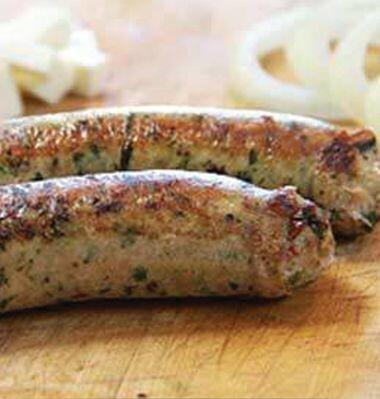 Eat them as they are, add a bun, slice ‘em up and top a salad or pasta, liven up an omelette, soup or dip – there’s really no limit to the many ways you can enjoy Rastelli chicken sausage! Our Italian chicken sausage incorporates roasted red peppers, basil, and garlic right in the links, but feel free to add some more to the pan for even more fresh flavor! This preservative-free, savory and sweet treat is a favorite of many customers. Love our Italian chicken sausage but want something a bit more unexpected? Buffalo chicken sausage is the mouthwatering blend you’re looking for! All-natural spices meet ground chicken and blue cheese for a superior chicken sausage experience. If you’re looking for something a bit more refined that pairs perfectly with pasta, consider our chicken sausage with feta cheese and spinach, or my personal favorite, chicken sausage seasoned with white wine, garlic, parsley and lemon. It’s the lighter side of sausage, which is perfect on a summer day, or when you want something satisfying that isn’t overly heavy.